Come context: The Master of the World wants to save the polar ice caps. Since he's going to rule the world someday, he wants it safe. The Champions aren't sure what to do. Then Captain Marvel and Alpha Flight show up. Some of this reminds me a little of the original NEW WARRIORS run. The team tried to focus on topical issues in some ways. After we find out the Master is stealing the magic of the area to run his machines, he blows them up and flees. 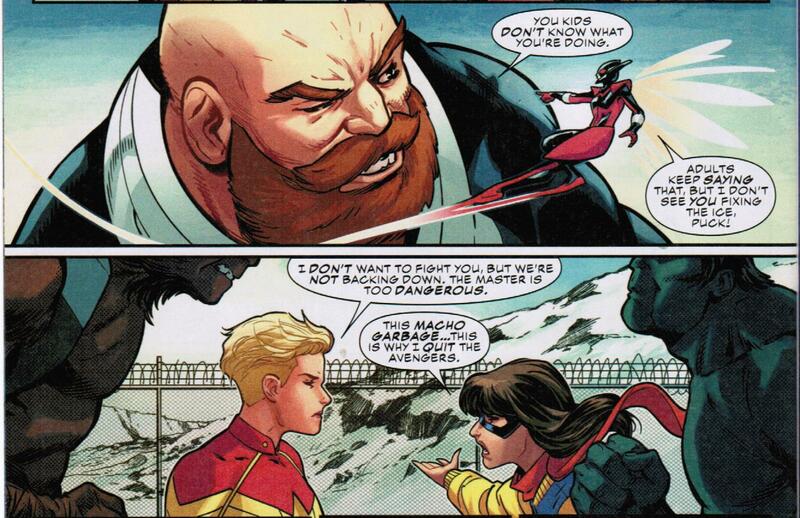 Has there been a "Kamala and Carol talk about CIVIL WAR II like civilized people" scene? There should be. Tony and Carol aren't going to talk about CIVIL WAR II like civilized people. At least not for a while. I suspect the scene where they mend fences in Ms. Marvel #28 is as close as you're likely to get. I miss All-New, All Different Avengers. That had a unique roster and some great interplay between the older and younger heroes (in my opinion). 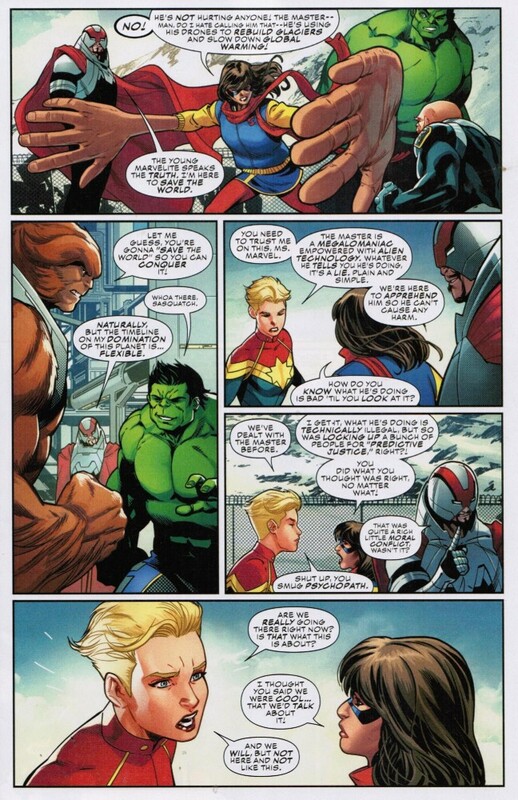 Yeah, Champions does seem to have dropped all nuance and gone with "adults are dumb" ... though the team was formed mostly because of Civil War 2 so the kids have a point. This forced hero vs hero trope, non stop comic events and mandatory attempts to match the comics with the MCU... this is why I QUIT reading Marvel. Yeah I dropped all but one Marvel title and with 2 In 1 coming to an end when FF comes out that will be it. These days its make mine DC. 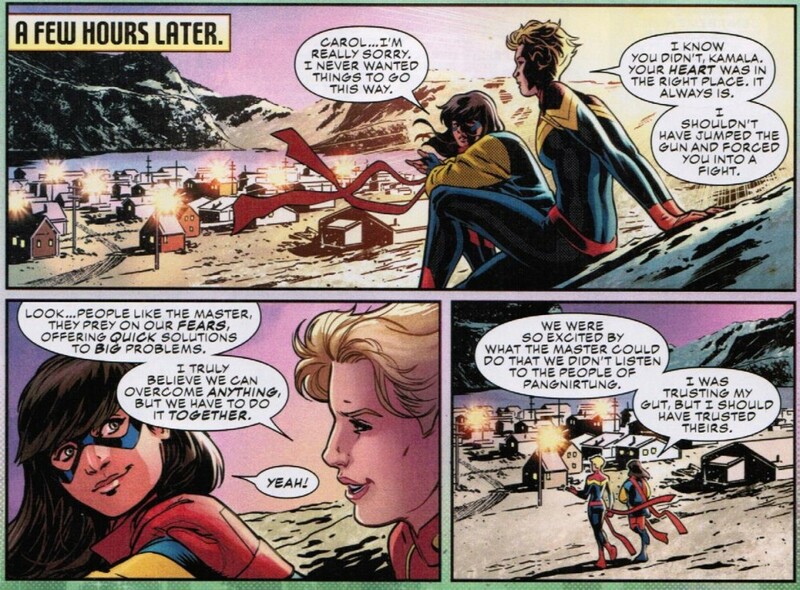 Didn't Carol flat-out kill the Master in Busiek's run on the Avengers? In defense of New Warriors though, they avoided easy answers. Isn't the lesson here that Carol was right and the Champions were blatantly wrong? In this case, yes. The Champions were "At least the Master is trying to fix a problem" until the whole "stealing the magic of the land" was revealed.